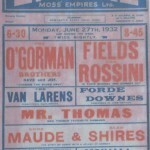 With grateful thanks to Mervyn Rossini, for the majority of photo’s and information on this page. 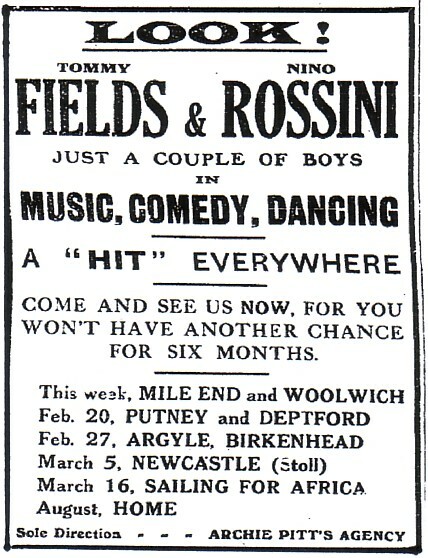 In the 1920’s Tommy Fields joined forces with accordion player Nino Rossini to form the double act ‘Fields & Rossini’. Below is a wonderful letter we’ve received from Mervyn Rossini, Nino’s son. 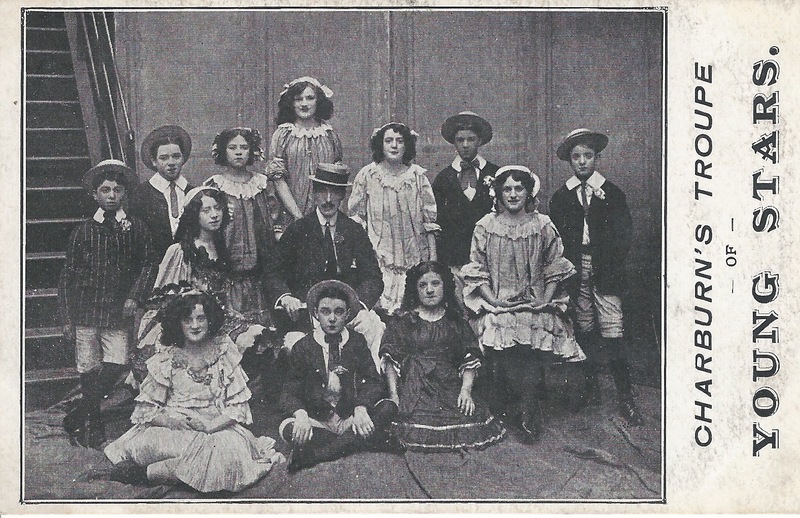 In it, Mervyn talks not only about his father, but also his maternal grandfather, Richard Llewellyn Griffiths, who ran Charburn’s Young Stars (the juvenile troupe Gracie was part of) and his friendship with Edith and Betty (Gracie’s sisters). 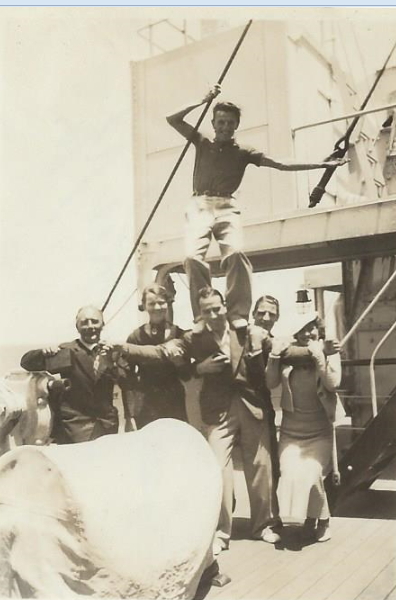 He also tells a very special and heartwarming story of when he visited Gracie in Capri. 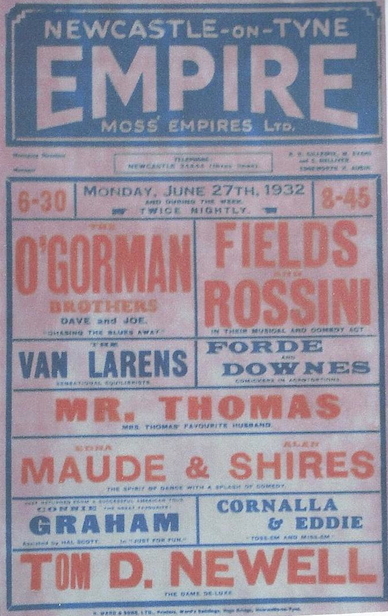 This is so special we had to give it a page of it’s own, as well as bringing to the fore the almost forgotten Music Hall team of ‘Fields and Rossini’. Thank you so much Mervyn. 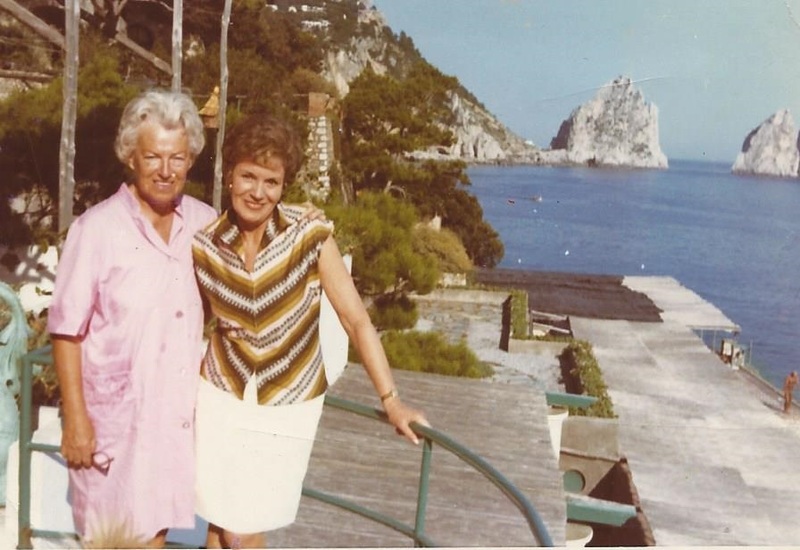 I have always been interested in this era of Variety Entertainment and, in particular, Gracie Fields because it is she who brought my parents together, and therefore I owe my existence to her. 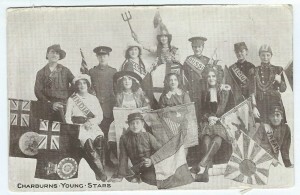 My maternal grandfather, Richard Llewellyn Griffiths ran a troupe of juvenile entertainers called “Charburn’s Young Stars” and my Mother was born while he and my grandmother Daisy were on tour in London in 1910. 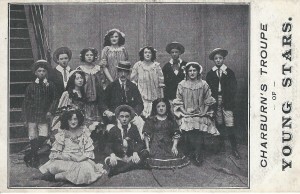 In about 1912 the troupe were performing in Rochdale and Grace’s Mother, Sarah (a scary woman) asked Richard if he would give Grace an Audition. He agreed and she was with Charburn’s for two years. During that time she became a friend of the family and, being the most maternal of the troupe, she tended to look after my Mother when necessary while they were all on tour. 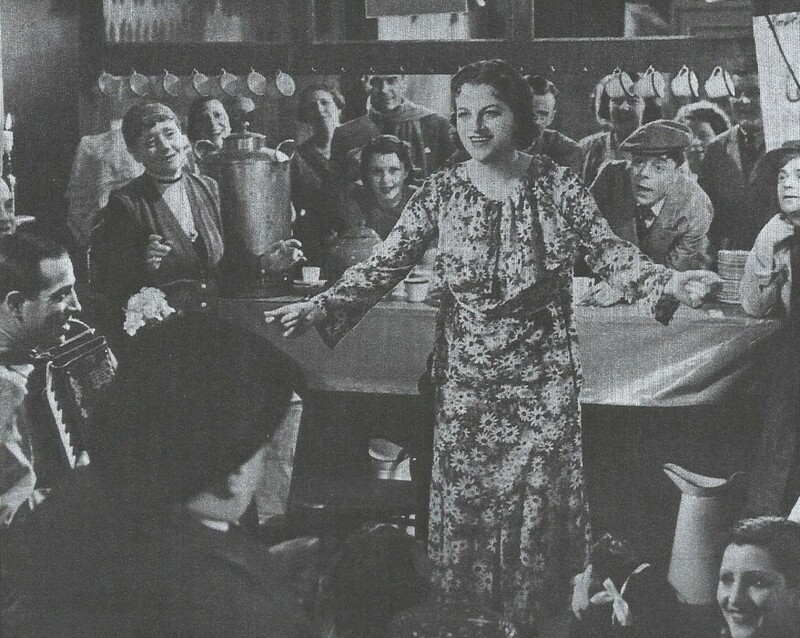 Richard encouraged her to sing the comedy songs, with which we are all so familiar, but, initially, she did not like that because she would say, after the show, (sometimes in tears) ” They’re all laffin at me“. 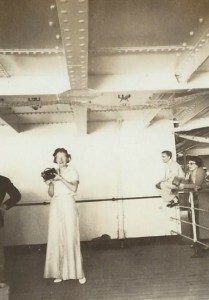 Richard persuaded her to continue and explained about laughing “with” and not “at”. I met Grace several times, and I was in Capri staying with her, together with my mother and my girlfriend in 1967. My mother asked her why Richard was not mentioned in her autobiographies. She explained that they were ‘ghost written’ and that her control was spasmodic. She told me that Richard was a lovely man and that as a young girl she was in love with him. 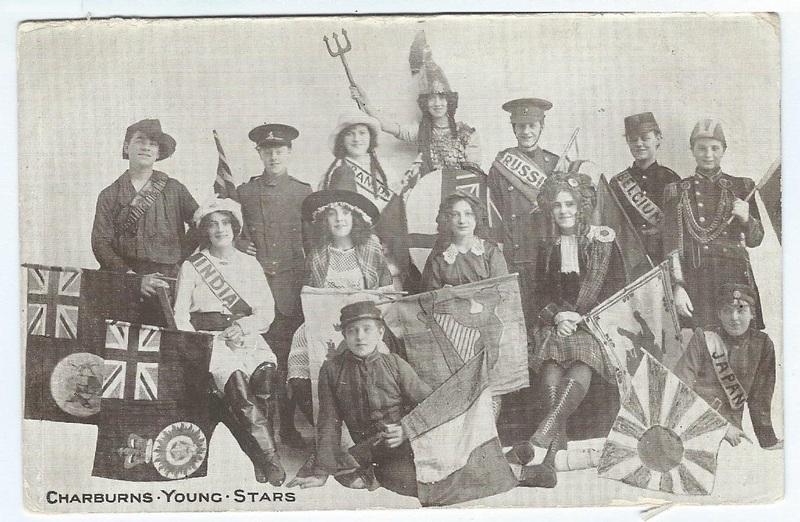 I think that ‘Charburn’s Young Stars’ folded towards the end of the first world war, but I have not checked this in ‘The Stage Archive’. 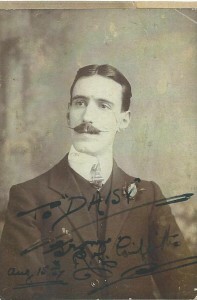 After this Richard became the manager at the Theatre Royal in Sunderland. He died tragically as the result of a brain haemorrhage in 1924 at the age of 47. I have a copy of his Obituary in the Sunderland Daily Echo which is quite impressive. By then Grace had hit the big time and wrote to my grandmother, Daisy asking if my mother would like to join her in London and be trained as a dancer. 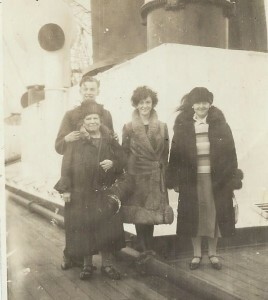 My grandmother wanted my mother to complete her education but my mother was very keen to join the show. Grace took her under her wing and had her trained as a dancer and looked after her. 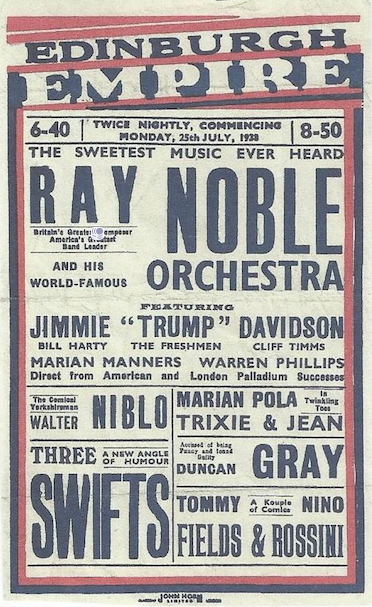 Violet (aka ‘Babs’, a name given to her by Gracie as she was the ‘baby’ of the troupe, and which stuck for the rest of her life) then joined Archie Pitt’s “The Pitt Girls” and worked in the show “By Request” which, I think opened at the Shepherds Bush Empire in 1925 or 1926. The show went on tour and did very well. 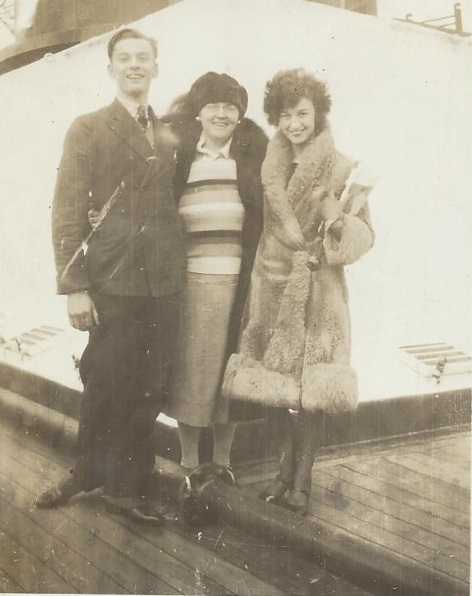 My Mother became very good friends with another dancer, Dorothy Whiteside who was later to become Tommy Fields first wife and my Godmother. 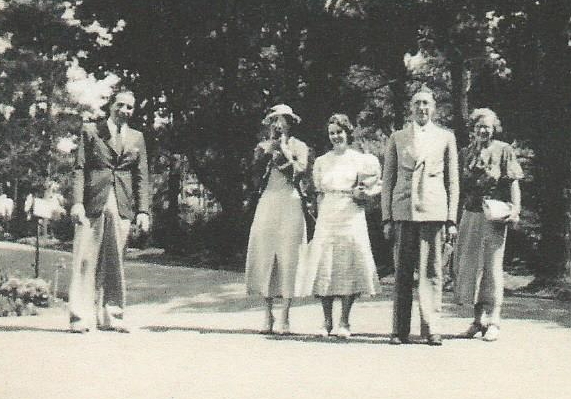 Dorothy was a delightful person and was always very good company although just a little eccentric. Her son Michael (who sadly died a few years ago) was a good man and a good friend of mine. 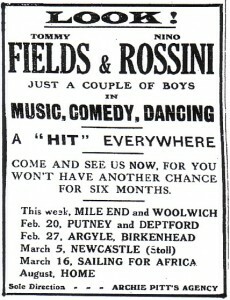 Meanwhile my father Nino had met Tommy Fields and they got on together extremely well. 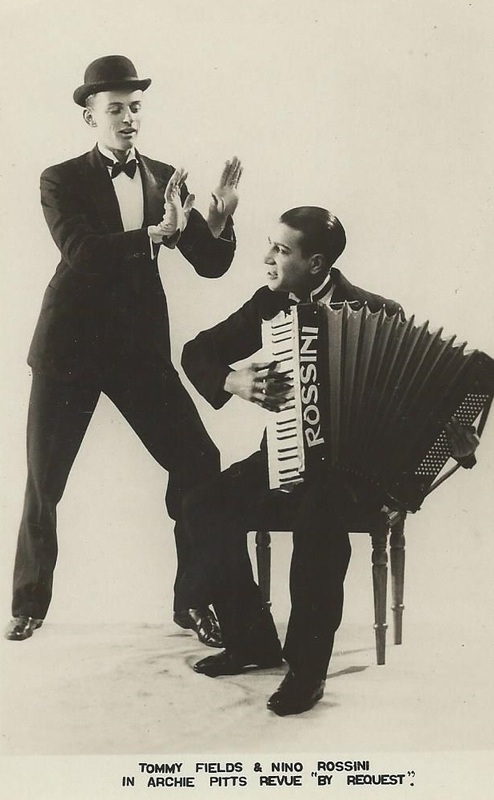 Nino was a talented player of the piano accordion, and joined the show “By Request” in January 1927 and, of course, met my Mother. They married in September 1928. 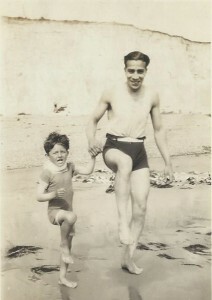 My brother Paul was born in January 1934 and I was born in January 1940. 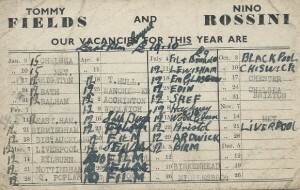 Dad and Tommy formed their partnership, I think, in 1928 and went touring throughout the country. variety artist), The landlady came back into the room and he again asked for a knife. She just folded her arms and glared at him, at which point he made a scene and stormed out in a rage, and she ran off terrified. There were many other tricks like that,of a more kindly nature, but they would also play jokes on each other. On one occasion Nino’s room was immediately above Tommy’s. Dad lowered a cotton thread from his window down to Tommy’s window, went downstairs to Tommy’s room. He opened the window, brought in the thread and tied it to another thread which was from a cotton reel inside a tin with a hole in it which he hid under Tommy’s bed. Dad went back upstairs and every time he pulled the cotton upstairs the cotton reel downstairs would make a loud whirring noise inside the tin. That night when Tommy was just getting off to sleep he would be woken up again and again wondering what he had heard. The strange thing is that Dad lost sleep too because he had to be awake to pull the cotton. 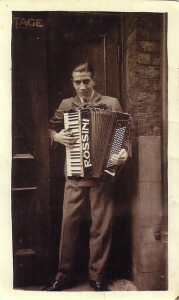 Nino started playing the piano accordian when he was quite young. 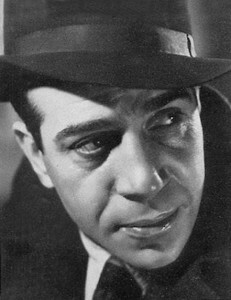 He was one of eight children born to Italian immigrants and they were poor and living in Clerkenwell (the Italian quarter) in London. He worked as an Asphalter and saved enough money to stop work for a few weeks so that he could concentrate on his music. After about six weeks or so he would run out of money and would have to start work again which would stiffen up his hands. He repeated this process many times until he gave up asphalting completely and earned a living in night clubs and in Theatres. He would practice up to eight hours a day. 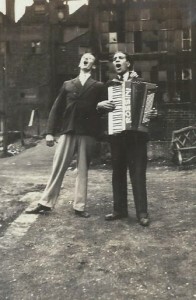 Music for the piano accordian was scarce so he would buy piano music scores and transcribe them for his instrument. He had three of them and would take them apart, clean, tune and reassemble them. He was supposed to be the third best accordianist in Europe. A man called Tollufson was the best. As a child I remember him playing classical music, just after the war. As you know Variety was dying due to Cinemas and television and he gave up the theatre and started a company of specialist contractors in the construction industry, which traded successfully until 1994. 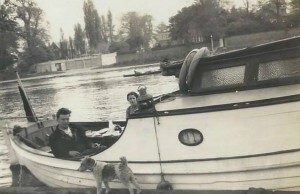 Nino died in 1965 aged 63 and is buried in Richmond along with my Mother, Babs who died in 1983 aged 73. Although they would travel, like everybody else, by train from town to town, almost ever Sunday, At one time they bought a three wheel Morgan and this was a lot of fun and more convenient than the train. They got lost one day and were in a country lane and drove through a ford. The water was deeper than they expected and they had to open the doors to let out the water. Later on they had a saloon car and they were driving somewhere in Bedfordshire. It was January and the roads were covered in ice. Tommy was driving and skidded into a ditch. Unfortunately the suitcases were piled on the back seat and came forward propelling my fathers head through the windscreen. That was not too bad but when he came back into his seat the glass almost cut off his nose. The ambulance took four hours to arrive, on chains, and took him to a local doctor because they wanted quicker treatment than another four hours to a hospital. The Doctor was out of his depth and made a mess of stitching it up but it was later redone by Sir Archibald McIndo. They should have taken the train. 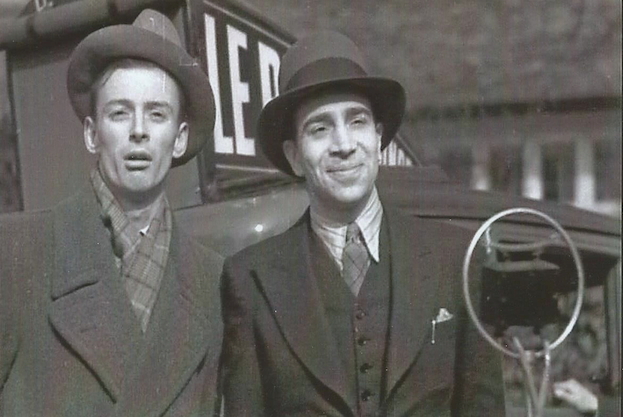 Dad and Tommy split up in 1938 because Tommy thought he would do better on his own. 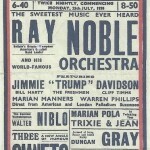 It was a shame because they had lots of very good bookings as a duo which were then cancelled. 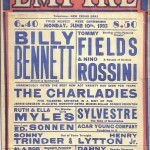 They had had a successful run toping the bill at the old Alhambra Theatre in Leicester Square, the London Palladium and of course many provincial theatres. Dad joined E.N.S.A. during the war and so did Tommy. The rest of the Fields family went to the USA. 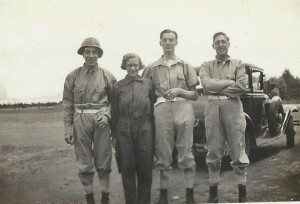 After the war Tommy and Dorothy were divorced but I don’t know much about that. I did meet his second wife whose name I think was Cynthia. She was from a wealthy family of shoe manufacturers from Nottingham. They had two daughters whom I also met but they seem to have disappeared. 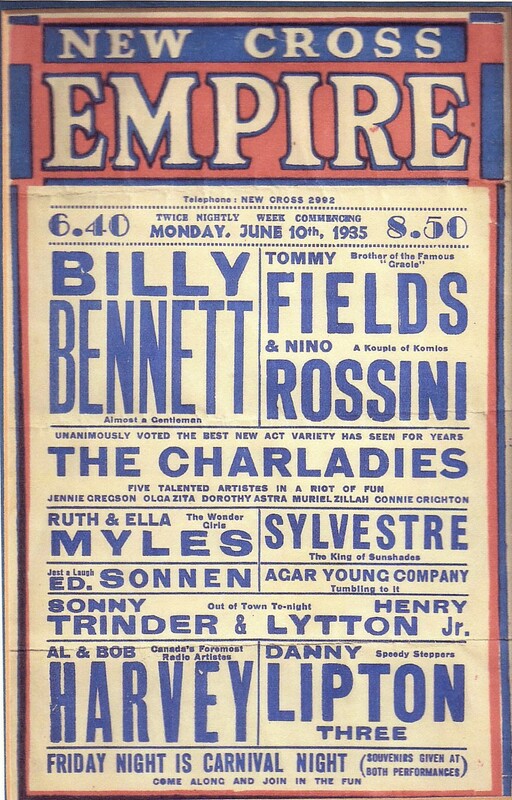 I met Cynthia at Betty and Eddy Saunders leaving party in Finchley, in about 1958 when they were about to emigrate to Australia. That was in Edie’s house. I was there with my parents and my brother Paul. 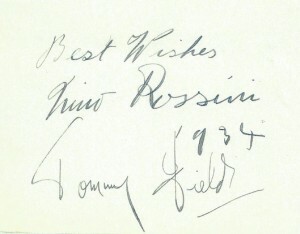 Tommy Fields was also there. Betty was a vivacious and talented woman of great charm. They lived in a house, just off Finchley High Road which looked like a pleasant but ordinary Edwardian terrace. Inside it was delightful. They were both Artistic. Betty was a very good sculptress and painter. 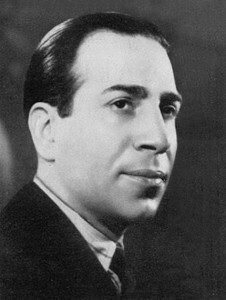 Eddy was a commercial artist and also very talented. The garden was surprising. It started out as an ordinary garden with herbaceous borders and a lawn. At the end of this there was a door into the courtyard of a pub although they were not “pub” people. But then the garden turned right behind everybody else’s garden and it was very long and divided into different areas like oriental; water; ferns etc. Eddy was a very keen gardener. Betty had a large studio in the garden which is where I saw the results of her work. I passed by there a few years ago but the house has gone although the pub is still there. The Tesco Supermarket and car park has taken over. I know that Betty died in Australia and Eddy lived on for several years but he suffered badly with Diabetes and I seem to think that he had part of one leg amputated. Tommy went on to marry Anette who already had two or three children and he had another child, a boy I think, by her. I met Anette and Tommy at Edie’s funeral at the Church of St. Lawrence in Telscombe Village. in Sussex. Tommy is now also buried in the Church graveyard, with a headstone which also mentions kindle his sister Gracie. I understand that he was a very capable and entertaining man on the stage and particularly good as a dame in pantomime. I mentioned earlier that I stayed at the Canzone del Mare in 1967 with my Mother and my girlfriend. 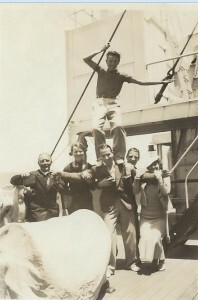 Grace appeared to be a very outgoing extrovert when in the company of a group of people. I got the impression that she felt that she needed to be entertaining and was, in fact, putting on an act. However when I was alone with her she chatted to me in a quiet way and was very pleasant company because the tales she told were the result of a rich and fast paced glamorous life although it did involve a great deal of hard work. I can only remember snatches of our conversations but they were very interesting. 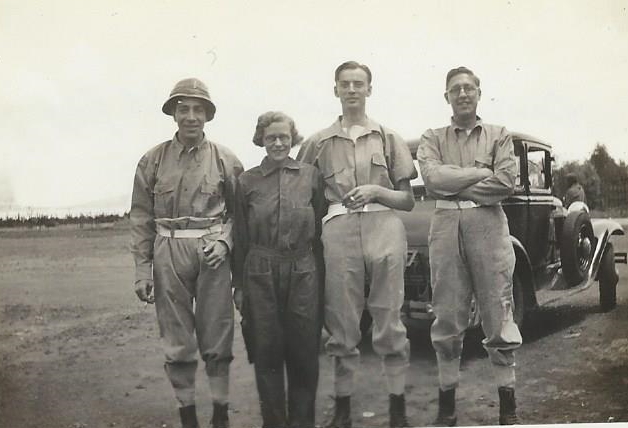 She talked about the time after Monty Banks died when she found that there were debts to be paid and she did a tour of the USA at a thousand dollars a night – big money in those days. She spoke of my Grandfather and of all the celebrities and royalty that she had met over the years. She used to go swimming for a short while every morning in the sea and had done this for years. One morning my girlfriend Josephine and I, were seated by the pool soaking up the sun. We were surrounded by the “beautiful people”, if you know what I mean. Wealthy people from all over the world, wearing expensive bathing costumes, jewelry and watches. 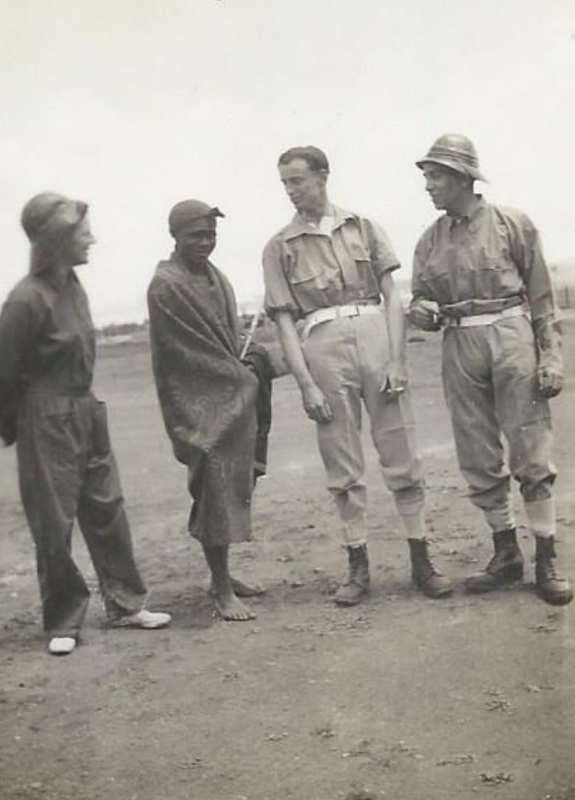 I was 27 years old and not yet confident enough to feel at ease in such a situation. 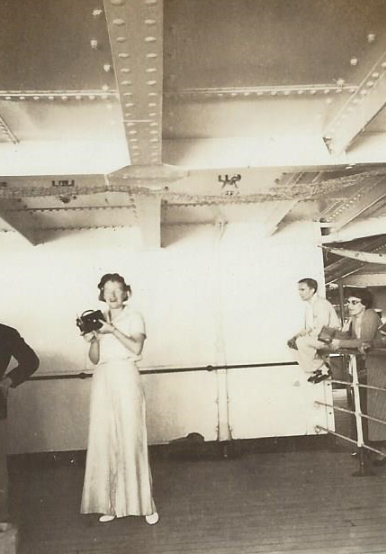 They glanced us up and down as if doing a valuation and then ignored us. 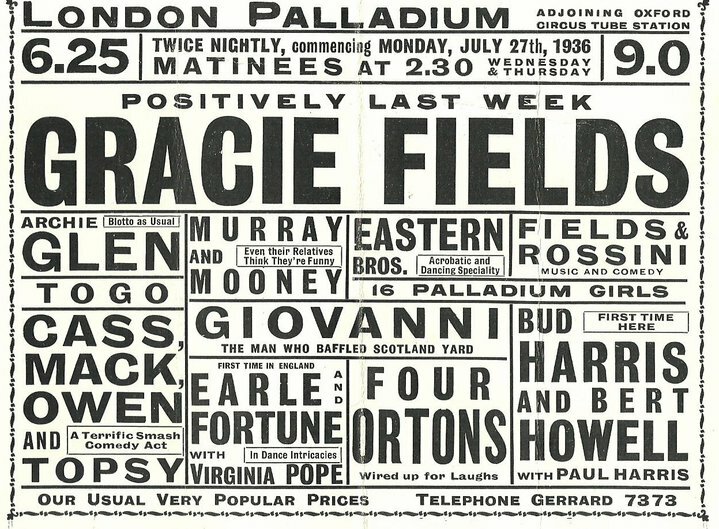 Just then I heard whisperings – “Oh look it’s Gracie Fields”. She had appeared from one of the upper levels in a onepiece black bathing costume. She went to the small jetty that protrudes out into the sea, climbed down the ladder, and swam for a few minutes before climbing back out. Instead of going back the way she had come she walked onto the pool area and the whisperings got quite excited. She came right up to us and said “Hello my loves, gin fizz on the balcony in ten minutes if you’re interested”. We responded with “Thanks we’ll be there”. When she had gone everybody turned towards us with a newfound admiration and they all wanted to be our friends. That taught me just a small lesson in life. We had late morning drinks with her on most mornings but the point that impressed me is that she had observed the situation and had approached us and spoke to us intentionally as a kindness and it showed the kind of woman she was. She was very generous to her family over the years and, as you know she did a lot for Charity. I met her on several later occasions when I visited Capri but didn’t get the opportunity to talk like we did in 1967. We sometimes went into the town of Capri with her and she would be stopped every few yards by tourists. One day we took the bus to Anna Capri and we all went up to Monte Solare on the ski lift and tea at the cafe at the top. Tourist were all over the place taking her photograph but they had another house in Anna Capri which was hidden away in a quiet street. It was so peaceful there and very well appointed. 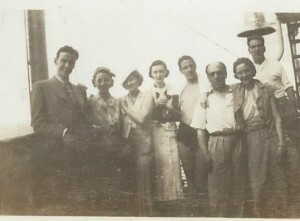 I have some old photographs of my parents in Capri, at Canzone, before it was developed. I remember my father telling me that her friend John Flanagan, the artist, introduced her to the island some time in the mid 1920s. My father and Mother said that he was the only man that she ever really loved and that she had bought the Canzone so that he would stay with her (he loved the island so much). 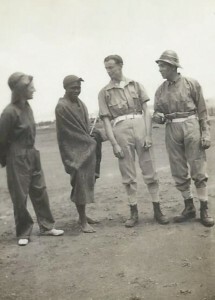 However, John Flanagan wanted to live quietly out of the limelight and that was not possible with Gracie Fields. I don’t know what to leave out of these ramblings because you may already know a lot of this. Her first husband Archie Pitt treated her badly, and I was never sure just how close she was to Boris. He was a very pleasant and a very sensible man although it was difficult to follow everything he said because of his thick Russian accent. I got the impression that he controlled her somewhat. 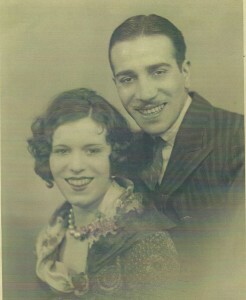 I haven’t yet mentioned her younger sister Edie who married Duggie Wakefield the comedian. They had two children – Grace who died a few years ago and Duggie. Anyway I saw more of Edie than any of her siblings. She was a very pleasant woman. 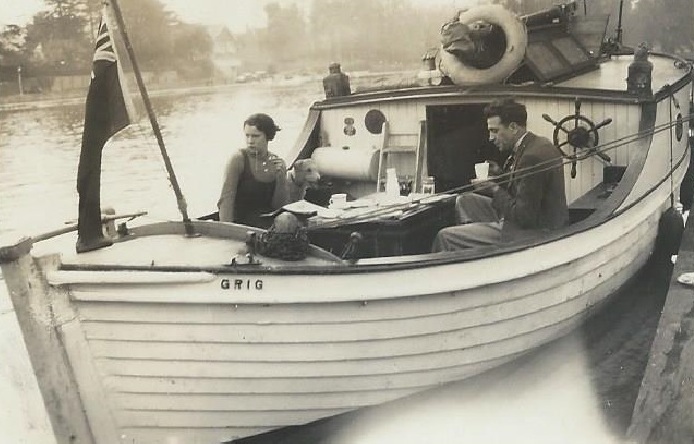 I first met her, and young Duggie and Grace when they were living at Roedean in a beautiful house overlooking the sea when I was about 12. I never met her husband Duggie because he died in the early 1950s. Edie bought a flat in my Mother’s house in Brighton and they spent a lot of time together. When my mother moved to a cottage just off the Western Road Edie bought one just a few doors away and they were able to reminisce about the old days and keep each other company.